Just thought I would say hello. I am a 34 yrs old and just bought my first violin, a Celilio CVN-300 from Fiddlerman sand a FM carbon fiber bow. It should be arriving some time in the next week or so. I cannot wait to start learning, my only music experience is with bass guitar and a little drums. I picked up Essential Elements 2000 for violin to help me learn, hope it was a good choice. I will post pics when the violin arrives. Essential element is a good series. Violin and bow hold are tough to get from a book when in doubt see FM videos. I have been watching the FM videos and practicing bow holds with a pencil. Welcome to the forum wshipley79, and thanks for your introduction. Plenty of helpful fiddlers here. Hope you like the CVN 300 and the FM bow. As far as beginning books are concerned, I believe that you made the right choice indeed. That combined with all the great stuff available online, you should have the tools you need to do a great job. My EZ rest shoulder rest arrived in the mail today, but no violin yet. Ok so I got my FM carbon fiber bow, Kaplan Artcraft dark rosin, and an extra set of Red label violin strings (recommended by the local music shop) and my old chromatic tuner. Still no violin in the mail, UPS is killing me. My first violin arrived just now and it's broken right out of the box. 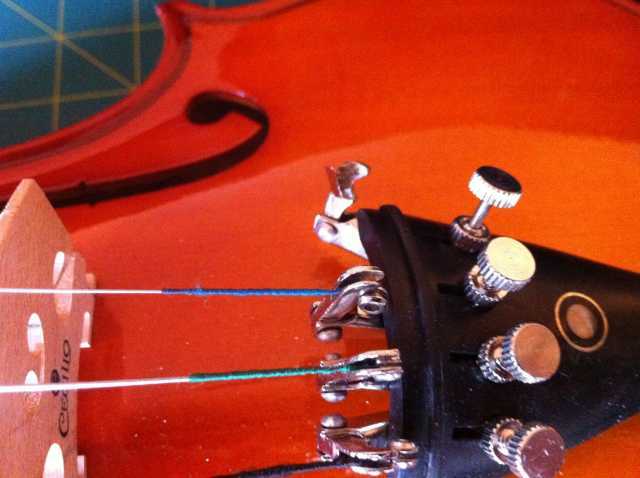 As you can see in the photo the fine tuner on the E string is bent and about to fall off, the E string was just lying in the case, and I cannot restring it. Very disappointed, I have been waiting to try and play, but I guess not. I have left a message with FM and sent him an email, since the violin was purchased from him. oh no, pain in the bum. still, hopefully that's something easily resolved. to my untrained eye that looks like something that should be relatively easy to sort out. It looks like the fine tuner was made at the factory wrong, its a cheap fix, but with shipping it will take another week to get here. What you could do, to get through the week.. is take the bad made tuner off. Then take the tuner that's on the low G string and put it where the E tuner was. The G string is comparatively easy to tune without a fine tuner, but on the E you probably will want it, at least at first. But that way you could tune up and play your new toy while you're waiting for the replacement tuner to come in the mail. One of the prongs that holds the ends of the string is whats broken (it was cut at an angle not straight down the middle like the rest), so if I switch it out with the G string, there is no where to hold the string. If you take off a fine tuner, you'll see that underneath there is a hole with a slot. The slot is wide enough for the string but not the ball end (the round thing at the end of the string). Technically, you could just take off the E fine tuner and use the slot and hole to hold the E string, but most folks seem to find the E string a bit hard to tune without a fine tuner. The G string is easier to tune without one. But the tailpiece can hold a string without a fine tuner. Fine tuners are optional, but most folks like to have one on the E string, at least. I don't use them at all on my acoustic, I just tune it from the pegs, as do a few other folks on these forums. Here's a pic of my violin's tailpiece to maybe give a clearer idea. Not saying that it is optimal, having just gotten your violin and all, but it would allow you to play it while you wait for the new tuner to come in. Thank you I just may try that when I get home. Sorry to hear about it wshipley79. I don't always find time to read all the posts on the forum including PM's but we always take care of our messages left at support@fiddlershop.com or directly from the site or calls to the shop. Michael my son works full time at the shop. That looks like a Cecilio to me. One of the only violins that we can't stock and test before shipping. The margins on those violins are so small that shipping and stocking them here would kill any profits. We would have to pay twice the shipping, once here and once to the customer. Spending time to go through the Cecilio instruments would also be costly. I am very sorry about your trouble and we will gladly take care of it as fast as possible as we always do when contacted. As others have suggested, you can either take off the fine tuner in the meanwhile or get the ball over the one fork that is left. If the ball doesn't fit over it, pass the end of the string through the hole of the ball and pull it down to a small loop and put it over the fine-tuner fork then string it back on the peg to tune. In the meanwhile we will be shipping your fine-tuner pronto. I just checked the notes for your order and saw that Michael had already shipped two fine tuners on the 10th. That was 6 days ago but you live in Alaska so it could take a while longer than most states. Hope you get them soon and again, we apologize for your troubles. Did you receive the email update about shipping the fine tuners on the 10th? I received my fine tuners from fiddlershop on Monday, and have started making noise.